The journey begins with our initial complimentary meeting that allows us to understand the vision, style and most importantly the story behind every client. We then take your vision and expand it to larger scale - we also begin to design and sketch various looks, environments, and elements while sourcing goods and vendors. Planning & execution starts the moment our clients accept and love our designs. We provide a 100% of our love and commitment to crafting beautiful experiences and everlasting memories - before, during and after your events. When it comes to your big day, our focus is to listen to your stories, thoughts, ideas, and visions and to take those to another level of presentation. 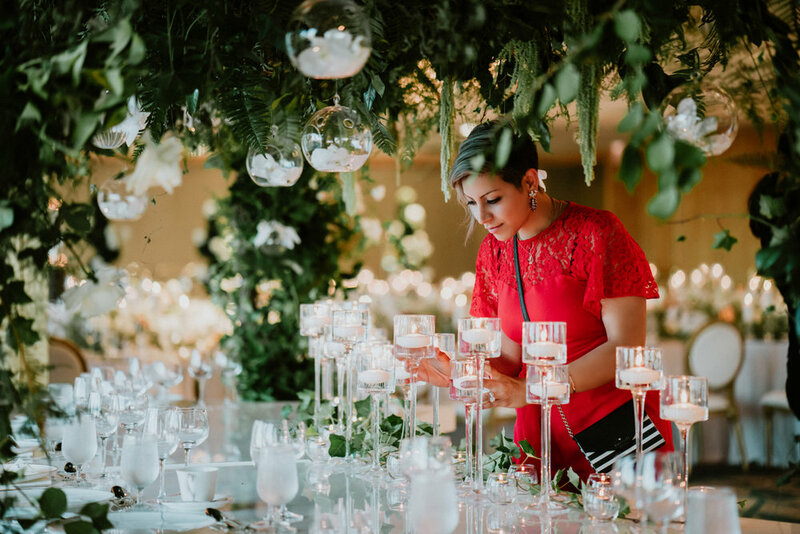 We will personalize and plan every detail to create a unique look and will ensure execution with absolute precision in both the planning and styling of your wedding. On your wedding day, our ultimate goal is to keep it calm, organized and fun. We will create a minute-by-minute schedule of your day and will contact all the vendors days in advance of your wedding to confirm all of the deliverables and agreements. We will take away all concerns from you and your loved ones so you all can stay present to your day and enjoy every moment of it. Event Design is all about bringing all the details together that speaks of your style, dreams, ideas hand in hand with our creative direction from start to finish. For example, the font on your “save the dates” or “Invitations”, the chairs, the linen material, tabletop goods, candle types and colours, all tell your story and we want to part of that story to assure every bit is told beautifully and perfectly and unique to you and only you. Flowers are the pure joy of our business and in our opinion they are the heart of every event. whether it’s a small jasmine vine or a large arrangement of roses, they bring liveliness and happiness to any space. We do flowers in house and nature is our biggest inspiration therefore we’d like to design flowers in the most natural ways as possible. We look at your Pinterest boards and listen to what excites you but we do not duplicate. Floral installations and unexpected use of flowers in event/weddings is our specialty and we bring your visions to reality in ways you haven’t seen before and LOVE so much more. Fruits and fruiting branches are also another elements that we’d like to incorporate in both our design and flowers. We absolutely love working on events that not only inspire us but the community as well. From corporate & launch events and citywide events to art & fashion shows and speaking series; our passion is to work hand in hand with you to expand your imagination, to produce successful results that are correlate with the goals and objectives of the event and to produce stories that create memories for your associations. Working with various designers, artists and local stores brings us pure joy! Styling your products in ways that showcase different functionalities and perspectives is one of the most exciting aspects of what we do. We also enjoy creating exceptional window displays that attract and inspire prospective shoppers - which leads to increase sales and store traffic.